If you’re reflecting today on whether your organizational strategy successfully leverages your core competencies in order to effectuate growth, you are not alone. Millions of the world’s people are sitting in offices around the globe at this very moment, being assaulted with the most torturous business jargon imaginable. And yet, we continue to do it. We continue to search for synergies and coordinate our moving parts and if at first we don’t succeed, we circle back. Let’s all agree to take a stand against corporate zombie speak. The first step is the toughest, but I know we will succeed in the end if we pull together. Inspired by a fellow communications professional, I recently asked my Facebook friends to nominate their most annoying business phrase. They responded with fervor. If you think they sound bad in a list, they sound hilarious as a song. 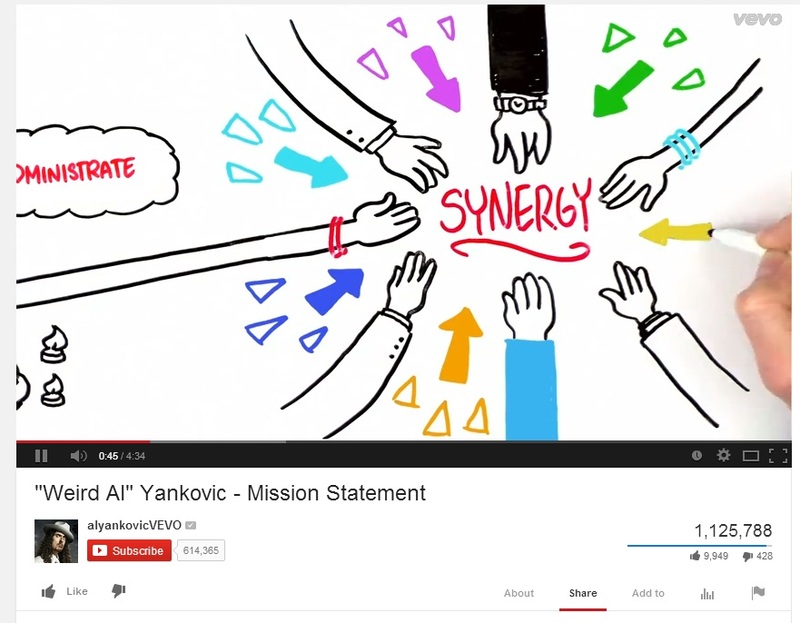 If you haven’t listened to Weird Al Yankovic’s “Mission Statement,” you really need to do so. Do any of these phrases make you cringe? Do you have others that you loathe? I’d love – or hate – to hear them. Your list did make me chuckle. We all have our own pet hate and mine is when people sign off emails "Best" - what is that supposed to mean? I understand it's a shortening of Best Regards, but "Best" c'mon! Strangely, and I know I am generalising, people seem to use that who are self important ... or am I wrong or being unfair? Russell - I happen to like "best" - when I use it, I'm thinking "all my best to you" as opposed to "best regards." "Sincerely" doesn't always feel right for people I don't know. We do all have our own pet issues - I don't like "warm regards" and I detest "pick your brain" (visualizing chickens pecking at my head - a subject I've written about on this blog). Full disclosure: I actually use "reach out" quite often - and I do often end emails with "Best." "Sincerely" sounds too formal for my communication style, as does "Best Regards." I also have no problem with "low-hanging fruit." But "core competencies?" Yikes. Anyway, glad the post made you chuckle, and thanks for commenting.